Dealing with the Legal, Constitutional and Human Rights Violations of the Smart Grid and Smart Meters. Thanks to http://stopsmartgrid.org/ for writing this report. Lloyd, I was a major contributor to this document to the US Congress with Liz and others but needed my name off if it due to the Criminal Fraud Case vs. TX PUC. I am a plantiff in Texas that is already on the docket of the Texas State District Court in Austin, TX on March 22, 2014. We see that it will be into court agaist the TXPUC in June 2014. We had smart meters put in over 3 years ago – I had no idea they were bad. Is it possible (in your opinion) to have them removed, or is it too late? I don’t have time to read a 257 page document? Can you just tell me how I can stop the power company installing one at my property. This People’s Initiative Congressional White Paper is long overdue as the rollout of wireless utility meter technology issue is the most serious one in its affects on citizen health and welfare in the USA. And even doctors do not know about it. 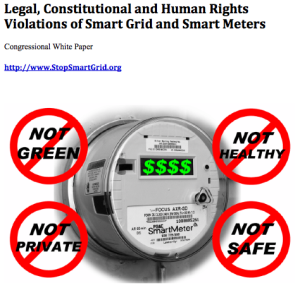 I have been working on educating people on this issue and their right to refuse the installation of smart meters on their property for almost three years now and have a “library” of thousands of peer-eviewed scientific studies which document and support every one of the listed problems in the People’s Initiative Report. Good news that you have highlighted this issue on your website! Congratulations and thank you. Very timely! I have been pounding away at the keyboard all morning regarding the the smart meter issue and am struggling with my power provider. I shared your post on facebook with a site for people fighting the smart meter roll out in there town. I will read this and hope to use this soon. Lloyd: Thanks for dedicating a complete page to this document. I have listed other human rights issues which need to be addressed by governments world wide. These “public utilities” are in violation of a number of international and regional statutes and laws which were specifically written to protect persons with physical or mental health disabilities. Governments that FAIL to provide legal accommodation to electro-sensitive individuals, are in violation of their own fiduciary significance. Note that the United States and Canada were agreement signatories to this Declaration. [“Under the Code, everyone has the right to be free from discrimination because of disability or perceived disability in the social areas of employment, services, goods, facilities, housing, contracts and membership in trade and vocational associations. This right means that persons with disabilities have the right to equal treatment, which includes the right to accessible workplaces, public transit, health services, restaurants, shops and housing. [“Article 2 of the convention prohibits torture, and requires parties to take effective measures to prevent it in any territory under its jurisdiction. This prohibition is absolute and non-derogable. “No exceptional circumstances whatsoever” may be invoked to justify torture, including war, threat of war, internal political instability, public emergency, terrorist acts, violent crime, or any form of armed conflict. Torture cannot be justified as a means to protect public safety or prevent emergencies. Neither can it be justified by orders from superior officers or public officials. The prohibition on torture applies to all territories under a party’s effective jurisdiction, and protects all people under its effective control, regardless of citizenship or how that control is exercised. Since the convention’s entry into force, this absolute prohibition has become accepted as a principle of customary international law. Nice work! great to know your on top of this.Just keep things going and together we all will have a stronger voice.The young and the aged are suffering more. We need governments to become aware and involved.Thanks for this update,IC BC Canada. Thanks Lloyd! Wonderful to see this support. I’m electromagnetically sensitive and would love to see public policies which support us so we can actually live fully out in public! I miss shopping sprees, dining at restaurants and hanging out with family and friends in public places. Keep up the great work! Thank you for the valuable information.